Yackandandah, a rural town in north-east Victoria, is 22 km south of Wodonga. It was named after the Yackindanda pastoral run which was taken up in 1837 as pastoralists reached the district from New South Wales. It is thought that the name was derived from an Aboriginal word describing a hilly landscape, particularly the ranges to the west and south of the town. Gold was discovered at Yackandandah in 1852-53 and alluvial mining extended generally north-east along Yackandandah Creek to Osbornes Flat by 1855. There was also gold mining at Twists Creek, west of Yackandandah. A settlement of about 1500 people formed at the site of the township by 1855, and in 1856 the township was surveyed and allotments sold. Among the early public amenities were the Waterloo Hotel (1854), a heritage listed stone bridge (1857) over Commissioners Creek, an Anglican church (1855) and the Bank of Australasia (1857). Yackandandah was the administrative centre of the Yackandandah shire (1864) and acquired an array of well built civic amenities: Bank of Victoria (1860), Anglican church (1861), a court house (1864) and an Athenaeum (1876). Bailliere’s Victorian gazetteer (1865) also recorded two saw mills, a flour mill, gold sluicing, five hotels and extensive alluvial and reef mining outside the township. The town’s population in 1871 was 552 persons. There has thus been little redevelopment pressure on the town’s buildings, and several have survived for preservation. By the 1880s most gold was being won by hydraulic sluicing, and the Victorian municipal directory (1887) recorded increased farming. 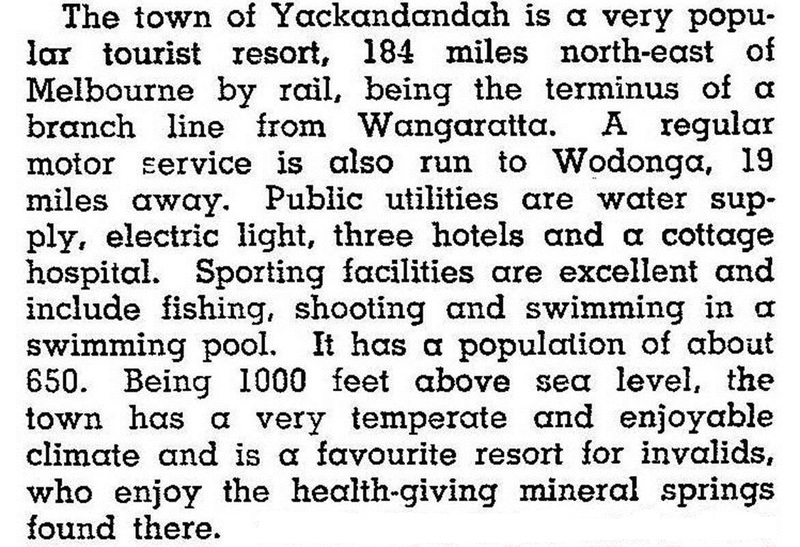 It also mentioned the Yackandandah Springs, well suited for invalids. 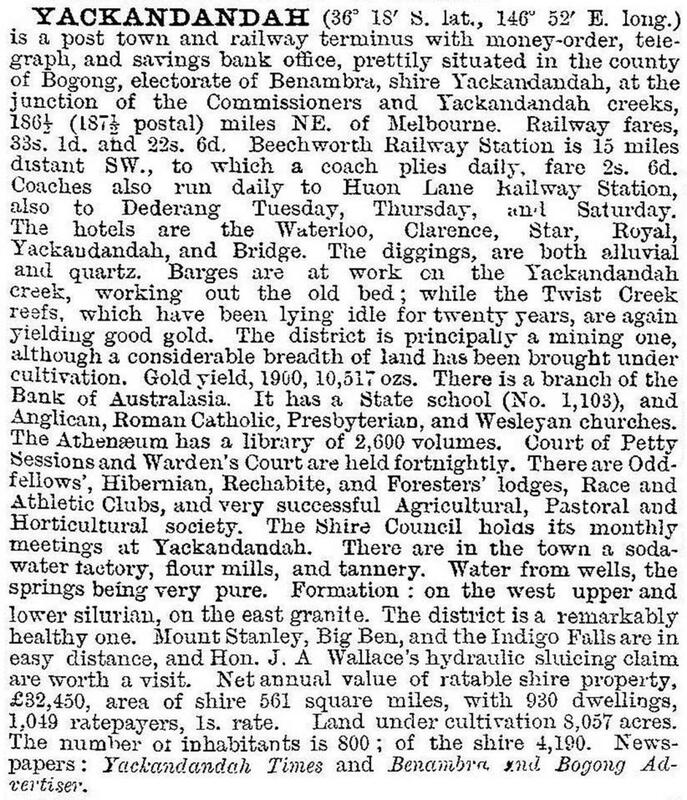 The Yackandandah times began publication in 1890 and the railway line from Beechworth to Yackandandah was opened in 1891. The railway line, seldom busy, was closed in 1955. In 1975 a conservation study of Yackandandah confirmed the substantial survival of the town’s historic character, foreseeing the prospect of a tourist base for the town’s economy. A Shire of Yackandandah Tourist Association was formed along with the historical society, and several craft outlets and galleries were opened. Yackandandah has a shopping centre, a hospital, a primary school (181 pupils, 2014), Anglican, Catholic, Uniting (formerly Presbyterian) and Lutheran (formerly Methodist) churches, a swimming pool, a golf course, two recreation reserves, a public hall, two hotels, a motel and a caravan park. Brochures for historic walks are locally published. Most of the town is a National Estate conservation area and the former Presbyterian church, Athenaeum, court house and Bank of Victoria are registered buildings. The bank has been converted to a museum. A grocery and hardware shop (1864) in High Street and the bridge in Isaacs Avenue, over Commissioners Creek, are also registered. To the south-west of Yackandandah there are old gold workings (including an artificial diversion of the Yackandandah Creek) and the Stanley State Forest. The forest has numerous walking tracks, camping places, but also unsafe shafts and tunnels. Following notice of the closure of the town's petrol station in 2002, the Yackandandah Community Development Company was formed and through shareholder subscription built a new Yackandandah Station located on an industrial estate, opening for trade in December 2003. Isaacs Avenue was named after Sir Isaac Isaacs (1855-1948), Governor General and judge, who lived his boyhood in Yackandandah until age 12. The Spring Migration Festival, a gay and lesbian event which attracted 2500 visitors to Yackandandah in 2008, was cancelled the following year by organisers due to homophobic attitudes in the town. A new Yackandandah Creek Bridge, on the Kiewa Valley Highway, opened in 2011 to replace the bridge badly damaged by floods in 2010.